Greece first competed at the Olympic Games in 1896, and have competed in all Games since then. They are one of five countries to have been represented at all Summer Olympic Games (the others are Great Britain, France, Switzerland and Australia). Out of these countries, Greece is the only nation to have participated under its own flag in all modern summer Olympic Games. As home of the Ancient Olympic Games, Greece is a natural choice to host the first ever modern Olympics which they did in Athens. That year, they finished second overall. Greece indeed has a perfect attendance record in the Summer Olympics but their performance is far from perfect. Other than in 1896, Greece has never ranked better than 8th overall and there are numerous times when they were not able to win a single Olympic medal (1900, 1924 – 1952, 1964, and 1976). The 28 year dry-spell that they endured between 1924 and 1952 was one of the longest in history for a country of its stature. The only thing that broke this drought for them was a bronze that Georgios Roubanis won for men's pole vault in November 26, 1956. For the Winter Games, Greece first participated by sending alpine skier Dimitrios Negrepontis to Garmisch-Partenkirchen, Germany in 1936. Since then, they had an almost perfect attendance record missing only the 1960 Winter Games held in Squaw Valley, California, Since their debut in the Winter Olympics, Greece is yet to win a single medal. Greece has hosted the modern summer Olympic Games twice. The games have each been held in Athens, in 1896, 2004. The Intercalated Games were also held in Athens in 1906. One of the Greek Islands, Crete, competed as an independent nation at the 1906 Games, before Crete was united with Greece. Greece is also one of the few countries that flew their own flag in the 1980 Summer Games in Moscow even though its government supported the US-led boycott of the Moscow Games. The Greek flag is also hoisted at the end of every Summer Games together with the host country as well as the next host nation. Greek runner, nineteen-year old Peloponnesian Charilaos Vasilakos, won the first ever marathon (a trial for the Olympic race), which was conducted a month before the Olympic Marathon. In the Olympic Marathon, he came second. 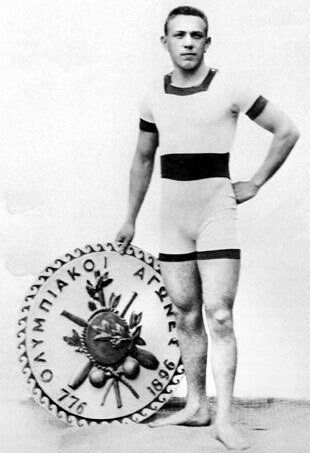 The youngest ever Olympian is Greek gymnast Dimitrios Loundras, who competed in the 1896 Athens Olympics. He was 10 years old.